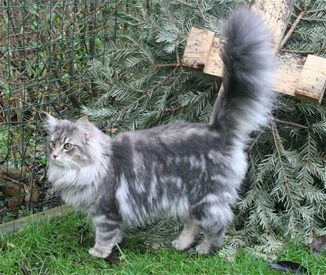 Bluebell showed that being a breeding queen in a cattery with kittens is not what she prefer anymore. Bluebell was so sweet and promising that we decided to keep her. It was a plan after Jasmine moved that we wanted another female after Celeste to continue after her. She is a strong female with a very good boning, nice triangle and chin. 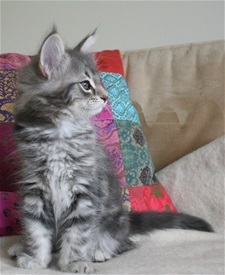 Her coat is a bit soft and her colour is teasing us - since her silver is very weak. We decided to show her in group 3 - without silver. Unfortunatelly Bluebell got stressed about litter nr. 13. We decided that it was better to neuter her, since she clearly shows that kittens is something she wants to live without. At least other females kittens.